With „Library of Souls“, Ransom Riggs’ young adult fantasy series that began in 2011 with „Miss Peregrine’s Home for Peculiar Children“ and was followed by „Hollow City“ three years later is now coming to an end and the story sets in exactly where the second book ended: with Jacob Portman being stranded in present London, separated from most of his peculiar friends who have been kidnapped by Miss Peregrine’s evil brother Caul and his wights and hollowgasts. 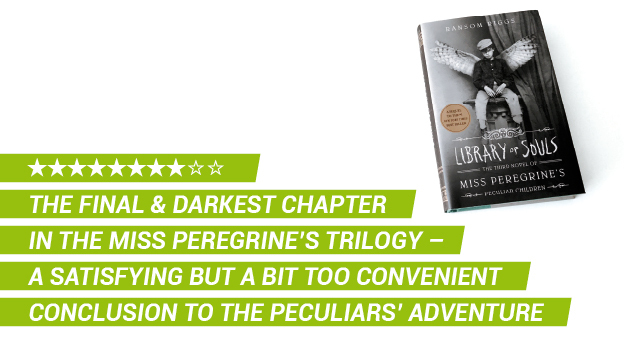 The search for Miss Peregrine herself, the ymbryne who protected the children with special abilities in a time loop in Wales for several decades and is still trapped in the form of a bird, seems more desperate than ever and with almost all of his friends gone Jacob’s and Emma’s odds for a happy ending have reached a new low. 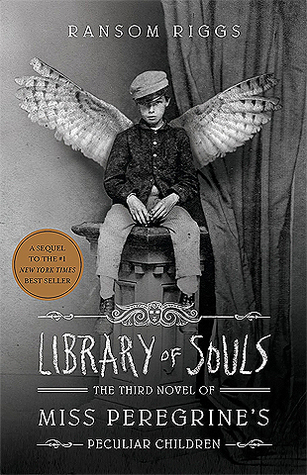 Given this hopeless situation it’s not a surprise that „Library of Souls“ soon turns out to be the darkest chapter in the „Miss Peregrine’s Peculiar Children“ trilogy and takes the characters to the ugliest stage of their journey yet when the search for their kidnapped friends leads Jacob and his peculiar girlfriend Emma to Victorian London’s notorious slum „The Devil’s Acre“. This 19th century hellhole becomes a nightmare for Ransom Riggs’ protagonists but actually is quite a pleasure for the readers since it’s definitely one of the most remarkable settings of the whole series. The author does a pretty good job of describing this rotten and dangerous place and thereby very early in the book creates quite a gripping and intense atmosphere. Devil’s acre is dark, ugly, stinky, clouded with fog and populated by some very nasty and unpleasant inhabitants who don’t even have to be wights or hollowgasts to pose a serious threat to Jacob’s mission and all this makes for a very fitting setting for this trilogy finale. I really liked how dark and morbid „Library of Souls“ was compared to the beginning and middle part of the trilogy and overall I would say that this atmosphere (which was once again intensified by lots of new old and odd photographs) combined with the new settings (Devil’s Acre, the Panloopticon or the Abaton loop with the eponymic library) and characters made this third book in Ransom Riggs’ trilogy my favorite one, even though I have some mixed feelings about the ending. I’m definitely satisfied by how the author wrapped everything up and answered all the questions but I couldn’t shake the feeling that the finale felt a bit too easy and convenient and the stakes never felt as high as they should have in my opinion. Nonetheless „Library of Souls“ still provides a good ending to Jacob’s peculiar adventure and I’m happy that in the meantime Ransom Riggs has already announced that there will be a follow-up trilogy that will „bring the story to America – which, as it turns out, is a much more peculiar place than anyone realized“ (quote from the author). With „Library of Souls“ Ransom Riggs brings his „Miss Peregrine’s Peculiar Children“ trilogy to a satisfying ending which takes its readers into the darkest chapter of Jacob Portman’s extraordinary adventure, providing a grim atmosphere, new fascinating places and interesting new characters and abilities – even though the finale might feel a bit too convenient after this long and challenging journey. When did you write this review? Lol. I haven’t read this series at all. Now that it’s completed maybe I’ll give it a try sometime. I was glad to see you enjoyed it – that’s encouraging for me haha.